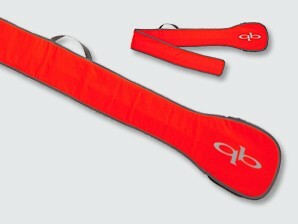 Large QB SUP Paddle Cover. This durable cover will protect your investment for many years. Comfortably fit large size QB paddles, maximum length 86". Zipper provides easy access. Perfect for traveling. Protects entire paddle, handle to blade tip. Prominent QB logo shows your pride. Easy carry handle built in.